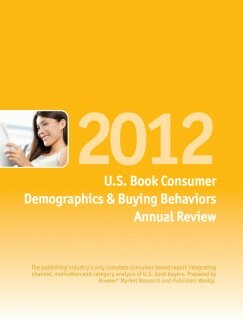 All of the data shared below was derived from the, 2012 U.S. Book Consumer Demographics & Buying Behaviors Annual Review, which is prepared by Bowker Market Research and Publishers Weekly and published 10th August 2012. I attended a presentation, given by PW and Bowker earlier this week where copies of the report were made available. The list price is $999, so I was happy to score a copy. "The Annual Review explores demographic changes in the context of overall market trends culled from the Bowker Market Research consumer panel of almost 70,000 Americans who bought books of any format and from any source in 2011." Again, the information in the 2012 book reflects purchaseS made in 2011 (the 2013 edition will be out soon), so that data presented immediately below is somewhat stale, but still interesting and valuable if you are involved in the book business. eBook sales have slowed and the decline in the sales of physical books is slowing and appears to be stabilizing. Of course this is just a microscopic sample of the information provided and discussed. 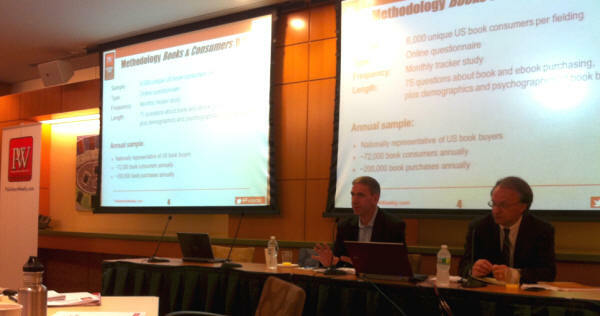 The presenters Jim Milliot and Carl Kulo U.S. Director, Bowker Market Research will also be presenting at Book Expo America in a few weeks.